This illustration, courtesy of the Nereus Program, sums up the dilemma facing fishes as ocean temperatures rise. GLOBAL WARMING IS CAUSING FISH IN THE OCEAN TO SHRINK in body size, say two scientists at the University of British Columbia. If the rise in ocean temperatures continues at the present rate, many fish are likely to decline in size by 20 to 30 percent, they say. Warmer ocean temperatures cause fishes’ bodies to warm up as well, accelerating their metabolisms and oxygen requirements, explains William Cheung, director of science at the Nippon Foundation-UBC Nereus Program in “Warming waters will leave fish gasping for air and shrinking in size,” a summary on the Nereus website of the findings he and lead author Daniel Pauly published in the journal Global Change Biology. 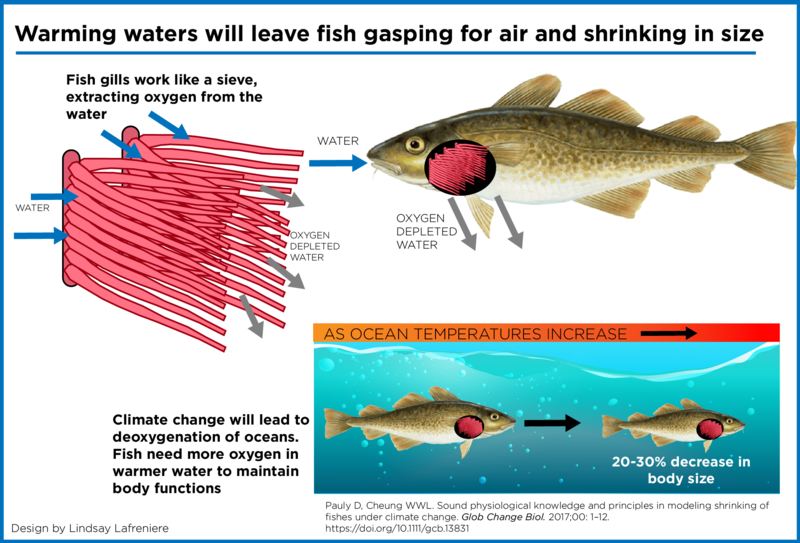 WARMER MEANS LESS OXYGEN The dilemma, Dr. Pauly says, is that while warmer ocean temperatures will result in less oxygen in ocean waters, fishes’ body mass grows at a faster rate than their gills, through which they absorb oxygen. While a codfish, for example, may increase its overall body mass by 100 percent, its gills will grow at a rate of 80 percent of that, or less. A fish’s gills feed its need for oxygen for energy. 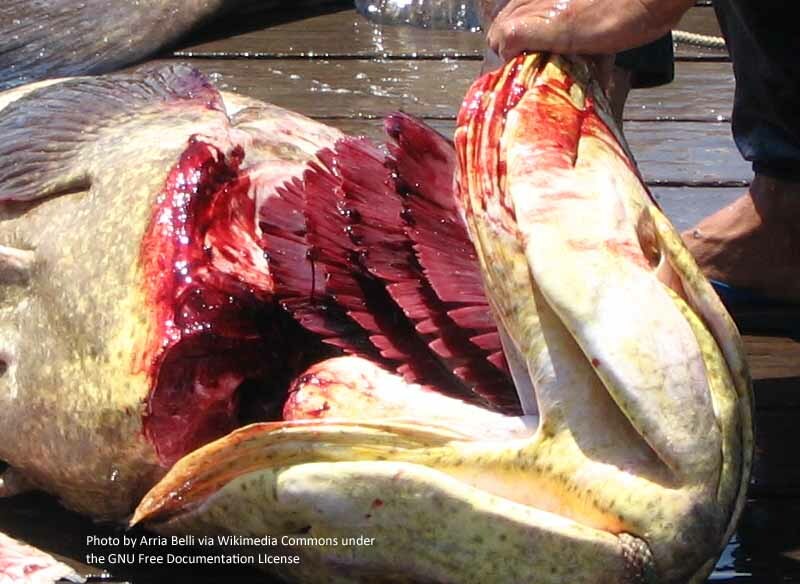 DIFFERING IMPACTS The extent of this phenomenon is likely to vary among species. Fast-swimmers like tunas, which require more oxygen, may be affected even more. The Nereus Program is an interdisciplinary collaboration between the Nippon Foundation, the University of British Columbia and other institutions in Europe and North America working to further knowledge of how best to attain sustainability for the world’s oceans. PRINCIPAL SOURCES: “Warming waters will leave fish gasping for air and shrinking in size,” www.nereusprogram.org; “Sound physiological knowledge and principles in modeling shrinking of fishes under climate change,” Global Change Biology.